The giver of all life, "Mother Sea" threatens to engulf, but instead it embraces a lone sailboat onward on its journey. 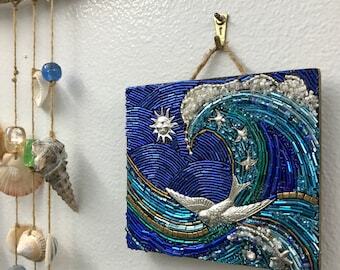 Sea life, birds, crystals, and a sliver of moon at evening tide adorn this blue and gold, ocean themed mosaic. Can you smell the salt air? 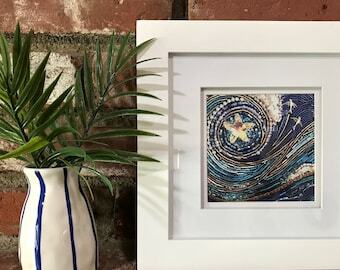 This Diana Maus original beaded mosaic was hand set with love for the mighty Pacific Ocean. 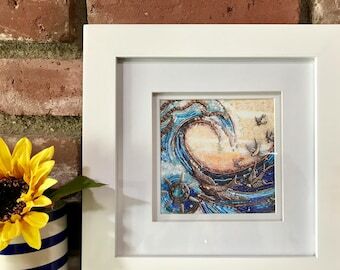 "Mother Sea ll" can bring serenity and joy to your home or make a wonderful gift for someone dear. Perfect for Mother's Day. This mixed media art wall hanging is 5" wide x 18" tall on wood panel. Ready to hang. I'm absolutely in awe of how stunning this mosaic is in person. 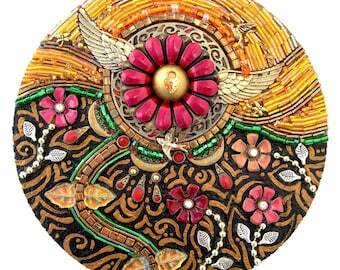 The intricacy of the beadwork is amazing. 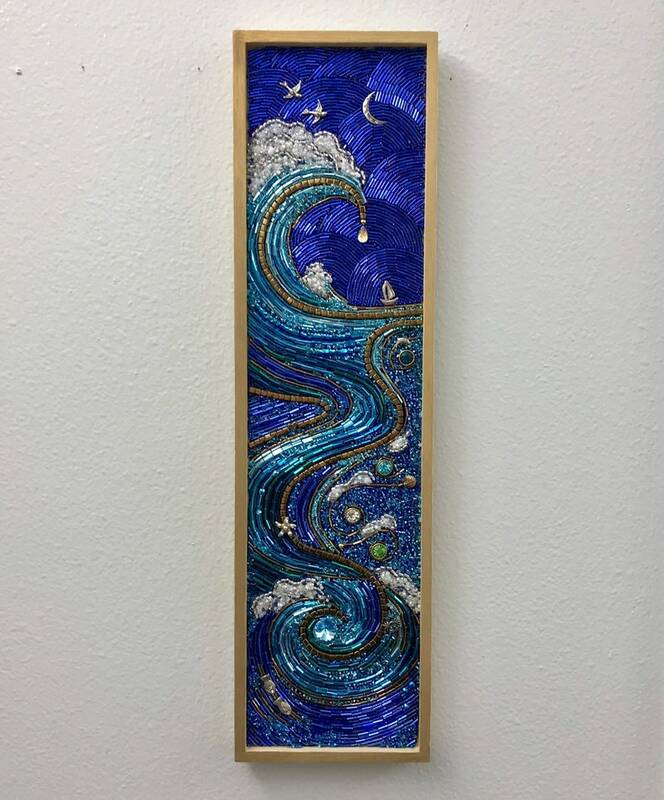 Diana's art pieces are a must for anybody that appreciates the ocean and its beauty. I live very close to the Pacific Ocean in Southern CA so this piece was especially perfect for me. Awesome and beautiful one of a kind piece of woodcrafting and ceramic inlay. Will proudly hang in our mermaid themed guest house (Mermaid House, Venice FL)! Wonderful work of art! Beautiful and eye catching! This artist is a class act! 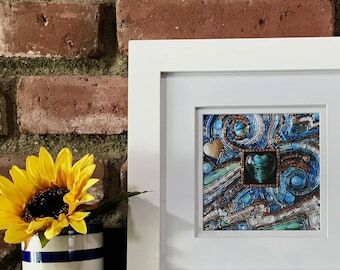 One of the best artists on Etsy!! Thank you!!! Your beaded mosaic needs a little extra care. 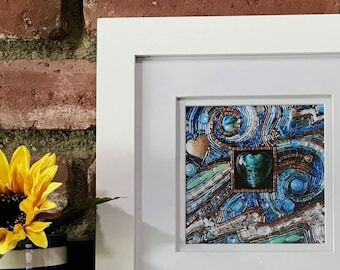 Only water-based, non-toxic jewelry glue was used in making this mosaic. The mosaic should be handled with care and never dropped. Protect your mosaic from prolonged or excessive heat (above 100º) and from direct sunlight. Don’t expose it to excessive moisture such as a patio, kitchen, or bathroom. Don't get the beading wet. Do not use water or any cleaner on the beading. Dust your beading regularly, using a spray can of compressed air. If you need to remove resistant dust, you may use a dry, very soft paintbrush. MosaicMoods is not responsible for damage that occurs during cleaning/maintaining artwork. Can I reproduce the artwork I purchased? No. All artwork is copyrighted 2019 by Diana Maus/MosaicMoods. I reserve reproduction rights to all artworks by Diana Maus. No returns or exchanges please. Artwork is a very subjective purchase. Please make your selection carefully! Feel free to contact me with any questions or concerns you have before purchase. All artwork is shipped with insurance and delivered with signature only. MosaicMoods packs all artwork carefully for fragile shipping and is not responsible for damage in shipment but I will file an insurance claim and refund your money once you have provided photographic proof of damage to me for to file the claim. MosaicMoods is not responsible for packages left at the door that are stolen. I ship all items with signature only.